You want a hotel for a few days on the French Riviera. Money is no problem, so it must be somewhere special – with a beautiful location, glorious views, spacious accommodation, impeccable service and food prepared by a chef of rare talent. Allow me to suggest to you a picture. A villa in honey coloured stone (just for you) is perched on a hilltop 8 miles from the sea, between Cannes and Monaco. Inside is a telephone, by means of which you can summon a Mercedes S class motor car and its chauffeur to transport you to and from a dining room in which you can tuck into spit-roasted chicken with, under its skin, thick slices of black truffle. Now that you have in mind this pleasantly sybaritic scene, let me give this place a name: the Château du Domaine St Martin. 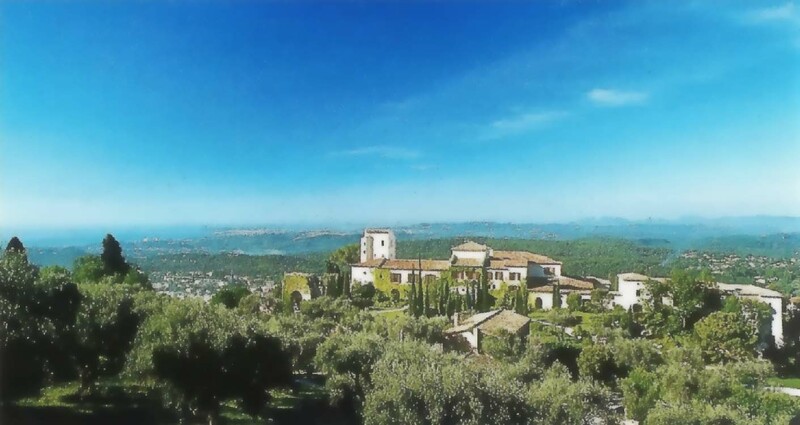 This temple of luxury and good taste is outside the ancient town of Vence. Or rather, it is above Vence. As I approached in the Royce, I thought the steepness of the ascent might test the old dear’s lungs, but we made it safely to a pair of high, wrought iron gates. Sensing our arrival, they opened of their own accord and we sailed through trimmed and glistening lawns to a ramp, which took us down into an enormous underground garage. Within moments, and without summons, a porter appeared. But no, the globetrotters should stay in the boot, for I was destined for one of the ‘cottages’ a little further up the hill. Not since Marie Antoinette played at being a peasant in the gardens of Versailles has the term ‘cottage’ been such a misnomer. For here was the villa of our picture (named Ponant), built into the slope. Through the hall I entered the sitting room, a forty-foot length of beige and white, with gilt-framed mirrors and warm red brocades. Through the three sets of French windows a terrace ran across the whole width of the building. I looked across the hills to Cap d’Antibes and the Mediterranean. There are very few hotel rooms in the world in which I could happily spend the rest of my days. This was one of them. It also has a splendid baronial hall of a dining room, with tapestries on the walls, an impressive stone fireplace and windows from which I gazed again towards the sea. With so much space, the tables can be as I like them: large and widely spaced. Their orange/brown cloths are not so inspiring. (I really do wish a law could be passed requiring good restaurants to use only white tablecloths.) Members of the waiting staff wear white tunic tops, or black tie or dark red jackets and are commendably formal and correct. Thus far it was clear to me that the manageress, Mademoiselle Andrée Brunet, has put tremendous effort into maintaining the highest standards at the hotel – in the 32 acres of grounds, around the beautiful swimming pool and in the immaculate rooms both public and private. As I sat back in my comfortable armchair and surveyed the menu, I surmised that she would have made sure that the food in the restaurant would be pretty good, too. And I was right. Chef Philippe Guerin is a young man with ambition. At present his cuisine attracts one star from the Michelin inspectors; he is determined to earn a second. On the evidence of my meal, he deserves to achieve his aim. Monsieur Guerin is attractively unassuming in his manner and very much a team player – consulting everyone in his kitchen about any new dish he is considering for the menu. His approach is that of the terroir chef, and he cooks the food of his native land and of the Côte d’Azur with a respect for his ingredients which I applaud. His dishes are well constructed, finely balanced and utterly delicious. This food reinforced my conviction that I could happily live out my days here. The all-French cellar has about 300 offerings, beginning with a £20 Côtes de Provence. You will look in vain for the most expensive bottles (there are no DRC burgundies and no Pétrus), but there are some good vintages in first growth clarets – 1971 Latour at £380 looking good value. Assistant sommelier Robert Hervé brought me the 1999 version of that well known white made near Aix-en-Provence, Chateau Simone (£49) – full-bodied with a sherbet nose and citrus fruits in the mouth – and the beautifully structured 1995 St Julien, Chateau Beychevelle – its dense black fruit still a little young, but drinking well now. As I was about to leave, Chef Guerin asked me to stay for lunch, to taste more of his dishes. My travelling plans would not permit it, but I was sorely tempted. Certainly, I must return – to report further on a kitchen which is clearly humming with talent. The Royce seemed a little sad to be leaving, too. The elegant and stylish Château du Domaine St Martin is exactly the sort of place which should have a Silver Cloud in its garage. Can any higher praise be offered? Avenue des Templiers, 06142 Vence, France.